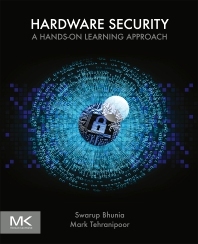 Hardware Security: A Hands-On Learning Approach provides a broad, comprehensive and practical overview of hardware security that encompasses all levels of the electronic hardware infrastructure. It covers basic concepts like advanced attack techniques and countermeasures that are illustrated through theory, case studies and well-designed, hands-on laboratory exercises for each key concept. The book is ideal as a textbook for upper-level undergraduate students studying computer engineering, computer science, electrical engineering, and biomedical engineering, but is also a handy reference for graduate students, researchers and industry professionals. For academic courses, the book contains a robust suite of teaching ancillaries. Users will be able to access schematic, layout and design files for a printed circuit board for hardware hacking (i.e. the HaHa board) that can be used by instructors to fabricate boards, a suite of videos that demonstrate different hardware vulnerabilities, hardware attacks and countermeasures, and a detailed description and user manual for companion materials. Appendix: Suggested practices for "secure digital design"
Swarup Bhunia is a professor in the department of Electrical and Computer Engineering at the University of Florida. Previoously he was the T. and A. Schroeder Associate Professor of Electrical Engineering and Computer Science at Case Western Reserve University. He has over ten years of research and development experience with over 200 publications in peer-reviewed journals and premier conferences. His research interests include hardware security and trust, adaptive nanocomputing and novel test methodologies. Dr. Bhunia received the IBM Faculty Award (2013), National Science Foundation career development award (2011), Semiconductor Research Corporation Inventor Recognition Award (2009), and SRC technical excellence award (2005), and several best paper awards/nominations. He has been serving as an associate editor of IEEE Transactions on CAD, IEEE Transactions on Multi-Scale Computing Systems, ACM Journal of Emerging Technologies, and Journal of Low Power Electronics; served as guest editor of IEEE Design & Test of Computers (2010, 2013) and IEEE Journal on Emerging and Selected Topics in Circuits and Systems (2014). He has served as co-program chair of IEEE IMS3TW 2011, IEEE NANOARCH 2013, IEEE VDAT 2014, and IEEE HOST 2015, and in the program committee of many IEEE/ACM conferences. He is a senior member of IEEE. Mark Tehranipoor is currently the Intel Charles E. Young Professor in Cybersecurity at the Department of Electrical and Computer Engineering (ECE), University of Florida. Prof. Tehranipoor has published over 300 journal articles and refereed conference papers and has given more than 150 invited talks and keynote addresses since 2006. In addition, he has published six books and ten book chapters. His projects are sponsored by both industry (Semiconductor Research Corporation (SRC), Texas Instruments, Freescale, Comcast, Honeywell, LSI, Mentor Graphics, Juniper, R3Logic, Cisco, Qualcomm, MediaTeck, etc.) and the US Government (NSF, ARO, MDA, DOD, AFOSR, DOE, etc.). Prof. Tehranipoor is a recipient of several best paper awards, the 2009 NSF CAREER award, the 2014 MURI award, the 2008 IEEE Computer Society (CS) Meritorious Service Award, the 2012 IEEE CS Outstanding Contribution, the 2010 IEEE CS Most Successful Technical Event for co-founding and chairing HOST Symposium, the 2009 and 2014 UConn ECE Research Excellence Award, and the 2012 UConn SOE Outstanding Faculty Advisor Award. Prof. Tehranipoor co-founded a new symposium called IEEE International Symposium on Hardware-Oriented Security and Trust (HOST) (www.hostsymposium.org), served as HOST-2008 and HOST-2009 General Chair, and continues to serve as Chair of the HOST Steering Committee. He is also a co-founder of Trust-Hub (http://www.trust-hub.org). Prior to joining University of Florida, Dr. Tehranipoor served as the founding director of the Center for Hardware Assurance, Security, and Engineering (CHASE) and the Comcast Center of Excellence in Security Innovation (CSI) at the University of Connecticut. Prof. Tehranipoor is a Senior Member of the IEEE, Golden Core Member of IEEE Computer Society, and Member of ACM and ACM SIGDA. He is also a member of Connecticut Academy of Science and Engineering (CASE). Usefull information for beginner in hardware security.